1st was Sbarro and then came Sammy Sosa, and then we attacked Moti Mahal Delux. 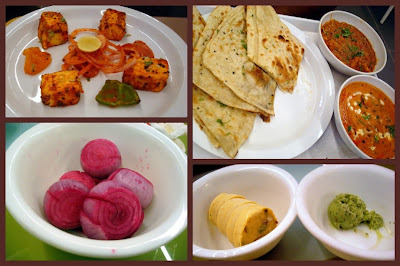 I have eaten at the outlet in Nungambakkam and so was familiar with their menu and food. Therefore it came as no surprise that the food here was excellent as well. The first plate that landed on the table was... yes, you guessed it right- Achari Paneer, and it melted in our mouths. Their paneer is exquisite, like no other I have ever had. This one was a tad spicy and so I had to request for some water. The non veggies got the Tandoori Chicken which they dug into. before we were done with these, the main dishes arrived. The tray was overflowing with plates. It had a plate with Naan/Lachcha parantha and 2 side dishes- one was Butter Chicken and other was Paneer Tikka Masala. As always, the naan being hot was easy to tear and eat, otherwise it does get a bit chewy. The gravy was good, not too rich not too oily. Oh and how can we leave without trying their infamous desserts. The minute I mentioned Paan ice cream wee saw 4 cups of ice cream float onto the table. I requested for Kulfi since I dont like Paan ice cream and voila, there was a plate with a kulfi cut into neat pieces.